So What If I Cry With My Patients? Is showing emotions best practice, or bad business? Ashley, one of my colleagues, and I got into a discussion about whether or not a doctor, nurse or other providers of care should cry or show emotion with a patient or client. We’re not speaking of meltdowns or becoming so emotionally involved that it impairs our judgement or makes it difficult for us to render effective care, but simply being able to show a human response in the presence of your patient at a time of extreme difficulty for the patient. Ashley felt as if this should never be done and is not beneficial for the client. She used the example of one of our fellow providers, who had known the patient for some time, cried with her patient after finding out the patient’s son was killed. My colleague found this to be unprofessional, and stated that Dr. Miles should not have allowed herself to get so emotionally involved with her client. Our patients expect us to be strong, Ashley had said. I somewhat disagree with my colleague. As someone who’s been on the receiving end of care; I know what it feels like to be a patient too. I’m sure practically all of us do. I’ve experienced the confusion, and devastation that come with having your world knocked off its axis by bad news, and being the needy and demanding family member who wanted updates every 30 minutes. During those times, empathy and compassion were so important for me and my family. When I abruptly lost my younger sister a few years back, I remember the nurse in the emergency room crying with me, as she kept telling me how sorry she was. Although this did not lighten my burden, it added a personal approach to my care and I felt like someone actually understood what we were going through. As a professional nurse, these are the moments that have helped guide me throughout my career. There have been several times over the years where I have shed tears with and for my patients and their families. I’ve never placed myself above sitting at the sides of their beds and holding my patients’ hands. I’ve embraced them. I’ve prayed with, and for them. Even in those happy moments I’ve shared in their joy. There is not a limit I put on the amount of laughs and hi-fives I give out when my patients are delivered news that gives them a sigh of relief. For me, and as I saw fit, showing emotion and being transparent with my patients have always been a natural part of my interactions with them. Because of this, I’ve witnessed improved communication on my patients’ part. They feel comfortable telling me their stories, and their concerns. They’re open and honest; which has allowed me to get a better clinical picture as to what was going on with them. There was such a feeling of gratitude and humility when I once sat at a patient’s bedside and listened to her tell a heart-wrenching story after being diagnosed with lung cancer. “I’m not afraid of death,” she had said. “It’s just that death has a way of having bad timing,” she continued. She went on to tell about how she was raising her two young grandchildren, ages eight and nine. Their mother was on drugs and had been in and out of their lives since they were a few months old. The boys’ dad, her son, had been in prison for the last five years leaving the boys in the care of her and their grandfather’s. I leaned forward and wiped her tears. Before I could say anything, she had placed her hand on my face and wiped mine. “Thank you for sharing in my pain,” she had said. There was no feeling of oddity, but at that moment, I was reminded of how much all of our lives parallel each other. We all require the same thing on this journey; compassion and empathy. I felt so blessed that day to had been a blessing. To keep ourselves from experiencing burn-out, a level of detachment is good, a total disconnect, I feel could weaken patient-provider relationships and have a negative impact on patient care. Showing some emotion not only tap into the human side of us, but it helps foster a therapeutic relationship, and builds trust; which leads to better patient outcomes. What are your thoughts as someone who provides care? 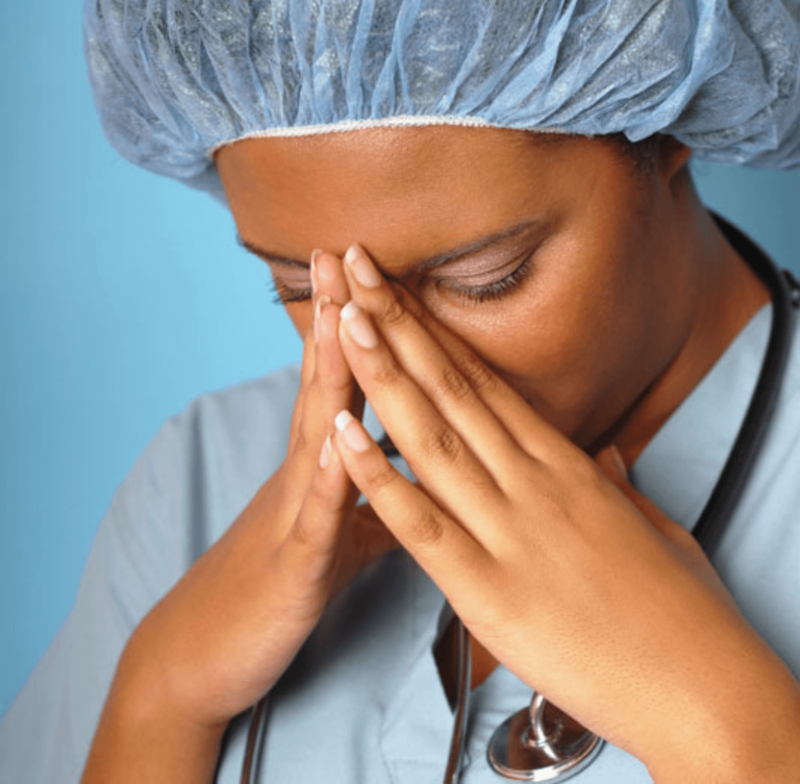 As a patient, would you find it odd if your doctor or nurse cried in front of you?